has given us a new prompt for this week. 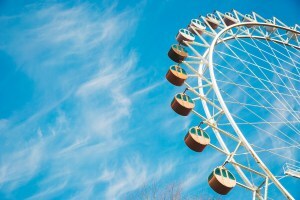 Sitting on top of the world, the wheel stopped spinning, the chairs waved gently in the breeze. Antoinette looked up, shading her eyes from the brightness of the sky. She remembered his insult as he climbed in the rocking car, after they’d queued up for two hours when she had chickened out of getting in the enclosed, tiny space and being lifted high into the sky. Rob might look like a pin-up movie star but she was beginning to realise looks weren’t everything. In fact she wondered why she was still here. She turned away from the crowds still lining up to enjoy this experience as she tried to stop the flood of tears she felt threatening to fall down her cheeks. Antoinette pushed her way towards the public conveniences and hoped that they would be empty so she could cry her eyes out in peace. There a young girl was leaning against the wash basin, her eyes were red and weepy. She caught Antoinette’s look, lowering her lashes and hiding her feelings. The poster on the wall she’d been studying mentioned suicide and how their organisation could help by talking to them confidentially. Antoinette smiled at the young girl, who gave a watery smile back, nodding her head in acknowledgement. Melting into the crowd Antoinette decided she would go back to the hotel instead of waiting for Rob. He could find his own way back especially after those nasty words he had thrown her way a couple of hours ago. The hotel room was a calm haven, decorated in peaceful, serene colours with beautiful prints adorning the walls. Antoinette laid on the bed thinking, her eyes taking in the babbling brook on the painting hanging on the opposite wall. 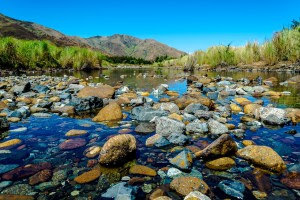 She wished she was there, somewhere in the countryside, small mountains in the distance, clear water running over large boulders. She could almost hear the rippling water, tinkling lightly as it sought its way to its destination. What was she going to do now? They had another week together on this holiday but she really didn’t know whether she could keep it together and pretend anymore. She nodded to herself. These few days had been rather an eye opener and she couldn’t pretend anymore that she really was going off Rob. His company was grating on her nerves. Last night in the hotel restaurant he’d made stupid, crass remarks about the Coronation Chicken that was on the menu. Laughing loudly about the name. She ordered it to spite him and thoroughly enjoyed every single bite. She thought about the young girl she’d met earlier in the day. She thought about all the things that made her unhappy. She thought about all the things that made her happy. She thought long and hard. She packed her suitcase, took half of the holiday money from the safe, thought about leaving a note, decided against it and made her way to the nearest railway station. Sounds like it wasn't the best holiday. I think spending 24 hours a day together is the true test of whether a relationship is going to work!